Whether your career goal is to keep the paychecks coming, advance your position or change occupations altogether, you’ll have a better chance of being successful if you develop a unique knowledge base or skill. So why not get the education you need to do that? Returning to school can seem intimidating. Here are some common stumbling blocks —and how to remove them. For those unsure of where to start, the Adult Center for Continuing Education Student Services (ACCESS) at the University of Delaware is an indispensable resource. Advisers can help with career planning and assist in choosing the best educational path to meet your goals. How will I fit this in with my other responsibilities? • Don’t be afraid to ask for help. Ask friends and family members for support and assistance. • You do not need to do everything perfectly. Decide what you can live with and without. • If you are a parent, share your experience of returning to school with your children. Let them see your hard work and determination to reach your goals. • Use a calendar or an app to help manage tasks and assignments. Celebrate your academic successes. Whether it’s doing well on a test or completing a course, savoring such milestones helps keep you focused on your goal. Is this really going to be relevant to my work? 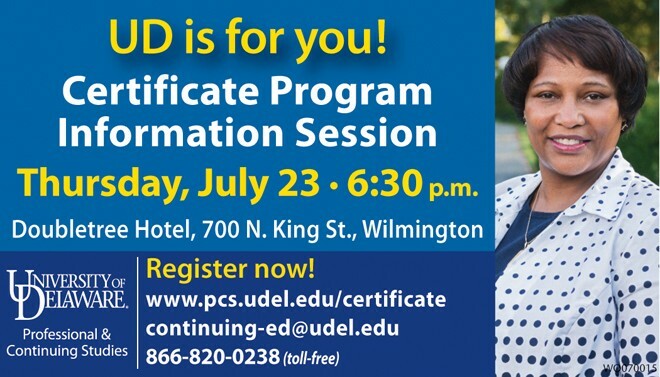 For skills that can be immediately applied, one answer is professional development certificates offered by UD’s Professional and Continuing Studies. These practical, concentrated noncredit programs are taught by practitioners in the field. Will I get lost in the shuffle as an adult student? UD’s ACCESS Center is a career and academic advising center just for adult students. Evening hours and phone appointments are available, and advisers are experts in helping adults reach their goals. Professional and Continuing Studies offers professional development certificates ranging from Clinical Trials Management to Social Media Marketing Strategy, from Project Management to Business Analyst. Many classes for academic credit are offered in the evening and online, and many graduate degrees are available. For more information: www.pcs.udel.edu, continuing-ed@udel.edu, or (302) 831-7600. Next Story → How Can One Teacher Make A Real Difference?